Passengers travelling to the United States from Toronto’s Pearson International Airport Monday morning are being urged to check their flight’s status before heading out the door after a fire at Terminal 1 disrupted operations Sunday night. Some U.S. flights are scheduled to depart Monday. But passengers are urged to contact their airline before heading to the airport. Emergency crews were called to the airport around the dinner hour Sunday for the fire, which was quickly extinguished. Heavy smoke hung in the air during the incident however, and some travellers were treated for smoke-related injuries, Peel police said. All flights to the U.S. scheduled to leave from Terminal 1 Sunday night were cancelled and a portion of the terminal was evacuated. A spokesperson for the Greater Toronto Airports Authority, which operates Pearson, confirmed early Monday that 29 flights were cancelled due to the fire. 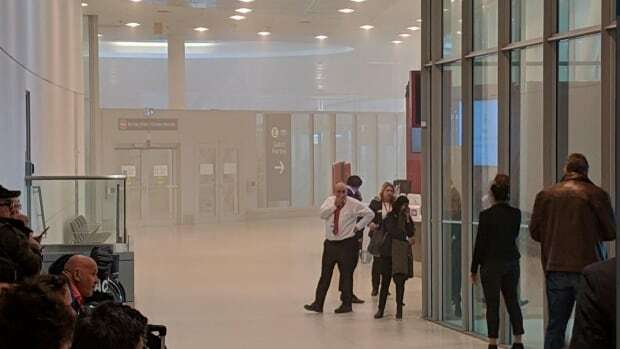 A passenger in the terminal at the time of the incident, who later had to leave the terminal when it was evacuated, said she saw smoke coming out of a display stand at a duty-free shop.